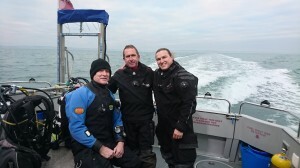 Steve, Milton and I had a trip out with Channel Diver from Brighton Marina. Weather hadn’t been bad the few days before and it was calm again on the day. Unfortunately the vis was pretty bad. Did see some squid darting around us on the wreck. Not a lot to report on this one! Still, was good to get out. At the end of the day we headed to Vobster, lured by news of fantastic vis and an easy kit rinse.